At one point, Don't Flop was one of the true powerhouses of English speaking battle rap, building a scene comparable to any in the world in terms of both interest, and dynamism. The past year or so has been somewhat volatile for the UK based league though, with key staff members appearing to transition into other outlets, and a certain malaise within the fanbase; a palpable feeling that fans were becoming disillusioned with the recent battles that Don't Flop are putting out. With their recently announced Checkpoint 4 card, Don't Flop are looking to silence every single one of the critics and to reestablish their place as one of the premier forces in battle rap. The card features two of the UK's best facing off for the Don't Flop title, several very intriguing Don't Flop debuts, and the return of one half of their biggest battle ever. The flyer, with full card is below. With only one exception, the past several years have treated Don't Flop champion Soul very well. He has some of the best performances in Don't Flop's history, and tends to hit a different level with the Don't Flop title on the line. He has established himself as probably the best non-North American battle emcee. If Soul is the best in the UK, Shox The Rebel may not be far behind. In 2016, Shox had very well regarded performances against Raptor and Tony D, two of the top guys in the country. At Checkpoint 4, he's hoping another strong performance will make him champion of the league. He'll have his hands full, Soul is often incredible, but if he's on his game, Shox could prove to be as tough a matchup for Soul as anyone. Arsonal’s last battle on UK soil against a British battle rapper is his 2012 classic with Shotty Horroh that should be reaching 10 million (!!!) views in the near future. Ars’ return to Don’t Flop has him facing off against another one of the country’s best, Tony D. While expectations that this could reach the levels of Shotty/Ars would probably be hyperbolic, Arsonal has been very strong over the past year or so, and Tony D has a long history of performing to his full abilities every time out. You can expect good things from this one. 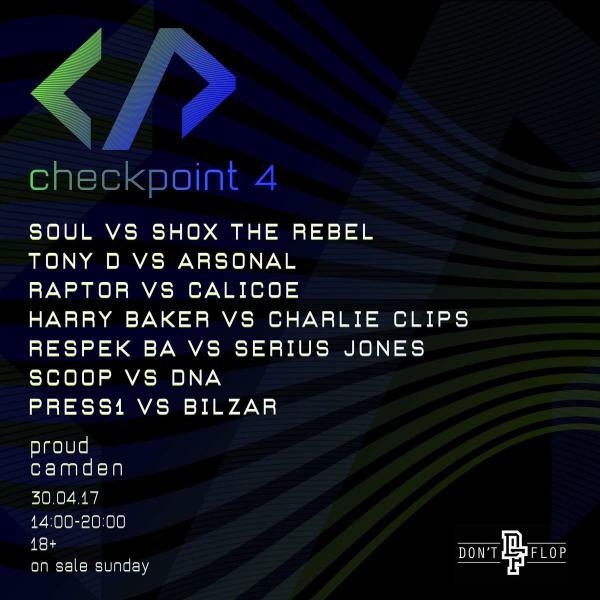 One of the biggest draws of Checkpoint 4 is the debut of one of the top battlers in the world, Calicoe, taking on one of the top spitters in DF, Raptor. While this is a potentially interesting clash it is not one without a little bit of controversy. After the card was announced, Don’t Flop emcee Quill posted that the battle was originally supposed to be Gemin1 vs. Calicoe, but after Gem pulled out of his previous battle with Raptor, this battle was given to Raptor instead. Quill found this move to have been underhanded, but fans were generally understanding of the decision. Honestly, both guys would have been good matchups for Cal, and to an extent, the real draw here is Calicoe’s UK debut. At his best, Calicoe is one of the best in the game, and unlike many of the other top tier battlers, he never stretches himself too thin with taking too many battles. Because of this, every Cal battle is must-see, and this could be the biggest opportunity of Raptor’s career. Elsewhere on the card, two of top veterans from the freestyle era clash as New Jersey’s Serius Jones makes his Don’t Flop debut against the recently returned Respek BA. Top tier Americans Charlie Clips and DNA return to the Don't Flop stage, and some of the UK's best get the biggest looks of their careers.